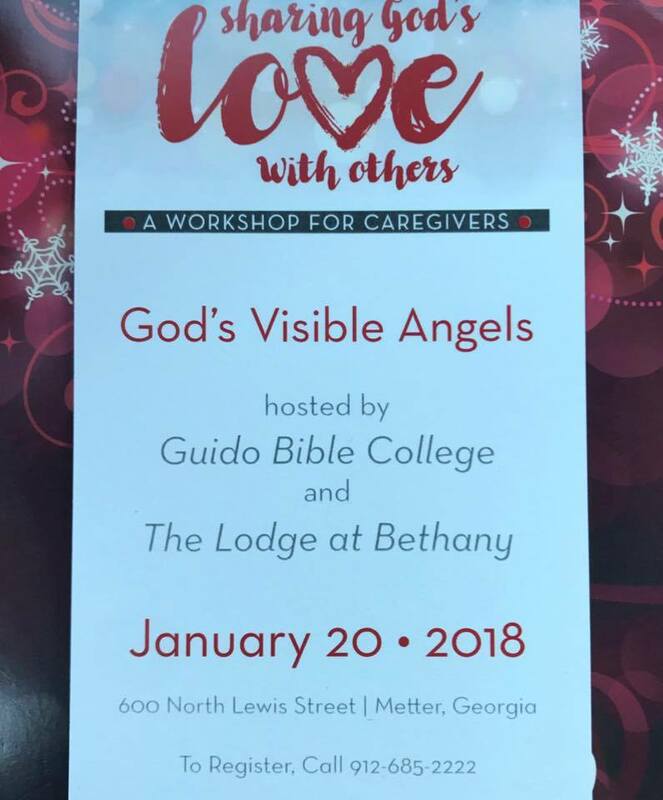 Guido Bible College and The Lodge at Bethany are partnering to provide a Caregivers Conference for the community. Are you a Caregiver or do you know someone who is that would benefit from a special day devoted to encouraging and honoring Caregivers? If so, join us on January 20, 2018 at Guido Gardens. For more info. call Guido at 912-685-2222. Also, help us spread the word-share this with all your friends! to honor the memories of those who suffered and made sacrifices on 9-11. To commemorate the 15th anniversary of 9-11, Guido Evangelistic Association will host a community-wide 9-11 service that will feature pastors from six local churches. The program will begin with a montage of pictures from 9-11-01, when the World Trade Center’s Twin Towers and the Pentagon were attacked by Islamic terrorists. The Georgia State Patrol Color Guard will post the colors and the Cedar Street Praise Kids will perform. A roll call of first responders has been planned as well. Brent Carter will give the invocation and Mayor Billy Trapnell will give the welcome. Prayers for Overcoming the Fact and Force of Evil as well as Healing, Strength and Courage and for Individual and National Repentance and Renewal will be offered Mike Newman of Metter Primitive Baptist Church; Allen Cason of Metter United Methodist Church; and Allen Kea of Metter Church of God. Another highlight of the evening will be the introduction of Captain Skip Sterling, who will join the Guido Bible Institute with a Crisis Intervention Ministry training program. When the day has been difficult and God’s wisdom seems out of touch, pick up a smartphone, click on eSeeds, and realize that no matter what the problem is “There’s an App for that.” Click here to go to the Apple page directly. Guido Evangelistic Association (GEA) has recently received word that the well-known and much loved Michael Guido telecast “A Seed for the Garden of Your Heart” will be aired on the NRB and DAYSTAR networks. These two Christian networks have a viewership of millions. Through the magic of television and satellite technology, the “most beautiful gardens in Georgia,” located in Metter, will be broadcast throughout the world. The video programs that put Metter, GA, on the map originated in 1972 when Dr. Michael Guido expanded his television ministry to include the one minute TV seeds that were filmed and produced in Guido Gardens. Even after over 40 years, the simple, inspirational and encouraging “Seed” has continued to be aired over television stations, satellites and the Armed Forces Network over 1.75 million times per year worldwide. The addition of NRB and DAYSTAR will more than double the potential viewership. To produce the “Seed” program from the grounds of Guido Gardens, Dr. Michael Guido worked with Mobile Production Services of Columbus, Ohio, for many years. Over 12,000 one minute telecasts were filmed, edited, and made ready for broadcast. Eric Riley, owner of Mobile Production Services, captured the beauty of the Gardens and enhanced the program with the signature sound of birds chirping as the program was introduced. That sound and the calming voice of Michael Guido became a mainstay of television throughout the 1970’s, 80’s, and 90’s. Visitors to the Metter area continue to stop by Guido Gardens to see for themselves the place they watched on television for so many years. “Almost all visitors who reminisce about watching Michael Guido on TV comment on the bird ‘chirp’ that came to be his signature,” said a GEA staffer. Many even whistle the tune! Eric Riley continues to support the Guido ministries even though Michael Guido passed away many years ago. As video and television technology has changed, he has kept the precious “Seed” program up to date. First, he re-recorded each of the 12,000 broadcasts using state of the art digital equipment so that they could continue to be broadcast as television has moved from the analog to the digital format. Whenever Riley is in the Metter, Georgia, area, he stops by the Guido Studios to visit with his old friends. On a recent visit, he brought forth an idea to promote the programs on some new television outlets. This led to the new relationship with NRB and DAYSTAR. NRB is the National Religious Broadcasters Network. It is an international association of committed broadcasters and Christian communicators who work together to spread the life-changing Truth of the Gospel of Jesus Christ through electronic media. Ironically, NRB presented a Milestone Special Service Award to GEA in 2009 even though the programs were not being aired through the network. The Milestone Award is given in recognition of pioneers in Christian communication who have demonstrated exemplary service in the broadcasting industry for five or more decades. DAYSTAR is an interdenominational and multi-cultural network committed to providing quality television to refresh the lives and renew the hearts of their viewers. It is one of the two largest Christian networks in the world. Operating over 70 television stations, DAYSTAR has a potential audience of 100 million homes in the United States alone. They also broadcast to over 200 countries and 680 million homes each day via satellite. With satellite and digital technology, their programs are also available “On-Demand” and through Livestreaming. As with all forms of media advancements, there are new requirements to make the broadcasts appealing to new viewers and to make them work with the newest equipment. Now each of the 12,000 minute-long broadcasts that have been upgraded from video to digital format will have to undergo another update. They will be re-mastered into high definition and high resolution format to make them suitable for 21st century televisions. Through the magic of television and its newest and most modern production techniques, people around the world will take a virtual visit to Guido Gardens in Metter, Georgia, where they will receive “A Seed for the Garden of Your Heart.” And the birds will continue to chirp!